It was such a blast last week to lead worship for about 750 folks gathered in downtown Chicago for the 2016 national conference of APCE (the Association of Presbyterian Church Educators)! Everyone was so engaged in worship, and I was blessed to collaborate with a fantastic planning team (thanks, Shawna Bowman and Nanette Sawyer!) and amazing musicians (thanks, Corey Nelson, Jodi Craiglow, Rob Clearfield, John Erickson & Jim Batson! ), many of whom have become good friends of mine over the years. I am indebted to my dear friend and colleague, Roberta Dodds Ingersoll, and the rest of the APCE planning team for inviting me into this incredible opportunity. Many asked for a list of the songs we sang, and the resources where they can be found. So, below is the list that I've compiled. Also, for those who attended my workshop on "Spiritual Journaling through Songwriting," or anyone interested in checking out more of my music, you can find my new EP, Pilgrim Miles, on iTunes, and CDs can be ordered on CDBaby. I also often post leadsheets and/or audio for original worship songs, retuned hymns, and hymn arrangements on this blog, or on my SoundCloud page. Stay tuned here for future musical adventures, and thank you for checking this out! Pilgrim Miles CDs now available! Today is a big day ... the physical CDs of "Pilgrim Miles" have finally arrived! I have begun the process of signing copies and packaging them up to ship out to all of the Indiegogo backers who selected perks that include signed CDs. But everyone else can now order physical CDs online TODAY through my CDBaby store! Also, I just found out that the album has been posted to iTunes (At a price point that is a bit cheaper than the download on CDBaby)! Exciting stuff! Check it out in your iTunes store. Feel free to pass these links along to any music fans you know! "Pilgrim Miles" can now be purchased online! "Life" has converged on our family in a big way over the past few months (I'll share more details when it's appropriate), and that has caused delays in getting my EP released this Fall ... But despite delays, I have good news! "Pilgrim Miles" is now available for purchase and download online! The digital album has been uploaded, complete with cover art, on my CDBaby page. I had hoped the physical CDs would be here before Christmas, but alas, we will have to wait until mid January for those ... I am really bummed about that, and I apologize. But the physical CDs have been ordered, and WILL come soon into the New Year! And if you were a supporter of our IndieGOGO campaign at a level that gets signed CD's, you'll be the first to get them. In the meantime, please feel free to share the download link with any music lovers in your life. And keep checking back here, or on the facebook-twitterverse, for updates about when the EP will be available on iTunes and for when CDs can be pre-ordered. Radio Debut and Guest Blog Post on UTR! Today, a pre-release sneak-peak of a song from "Pilgrim Miles" was featured in an all-DIY-artist episode of my favorite music podcast and syndicated radio show, Under the Radar! Check it out at RadarRadio.net, and find it on iTunes or your Podcast app! Also up today is a guest post I wrote for Under the Radar's blog, chronicling the journey of writing, recording, and crowd-funding my EP. There are even some behind-the-scenes pictures! Hello friends! This is a bit delayed, but we are celebrating the successful completion of the Indiegogo campaign for my new EP, Pilgrim Miles! Woohoo! We were blown away by the generous outpouring of support from friends all over the country, who surpassed our initial goal in less than 48 hours, and ultimately helped us raise almost $4000 toward making this dream become a reality. Marla and I couldn't be more grateful! Lots of other things have been happening behind the scenes for this project lately. My friend and producer, Chris Meyers, and I have been going back and forth getting the mixes of each track tweaked just right. The songs are sounding great! One of my biggest hopes for this project was for Chris to surprise me with some great ideas that were totally not my own ... and he has done that. I can't wait for you all to hear them! I also had the opportunity, thanks to the additional funds raised in the campaign, to go back into a local studio here in Chicagoland, and record an additional song, "Be Like Trees (Psalm 1)." It was a simple session, with vocal and piano, but with the lovely addition of Audrey Snyder on cello! At this point, I'm not sure whether it will end up as a sixth track on the CD, or if it will be the exclusive bonus track that get sent to backers of the EP. Either way, it's a song that really, in my mind, fits with the rest of this project, so I'm really excited we got to record it. Then just a week or so ago I was out in the middle of the Rollins Savanna preserve near our house, with good friend and fantastic photographer, Vanessa Griffin, for a photo shoot. Vanessa is designing the CD packaging in addition to doing the photography, and she just send me the first proofs. It's all looking so great! At this point we are on pace for a release sometime early Fall. I'm still hoping for the month of September, but we'll see. Stay tuned here, or (even better) on facebook, and I'll keep you posted! These myriad pieces are coming together, and I couldn't have done it without the help of all of these friends, my amazingly supportive family, all of you who have pledged your financial support and helped spread the word, and the One from Whom all blessings flow. Thank you! 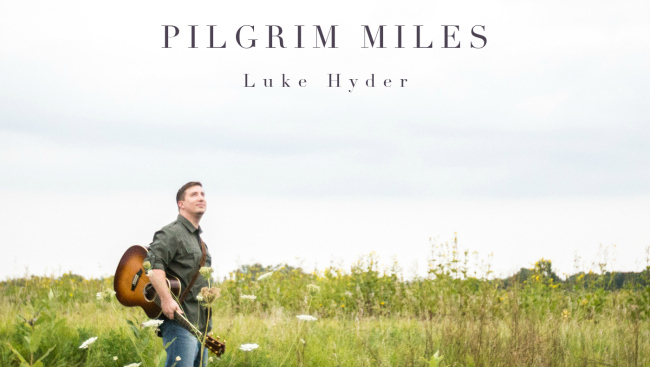 Today my IndieGogo campaign for my upcoming EP release, "Pilgrim Miles", officially launched! Find out more, spread the word, and PRE-ORDER the CD right HERE. "Pilgrim Miles" IndieGogo campaign COMING SOON! In the next week or so I will be launching an IndieGogo campaign to fund a new 5-track EP of original songs! Stay tuned to facebook, twitter, etc. for an opportunity to support this effort. The project is called "Pilgrim Miles", which is a phrase from a line in the chorus of this song, "Borrowed Shoes". The track above is just a rough home-recorded demo. But last month I was so blessed to be able to record this song and four others in Nashville with my good friend, Chris Meyers! They're being mixed now, and we need a little extra financial help to get the project mastered and printed. I can't wait to share the full recordings with you all soon! Please consider jumping in and helping us make it a reality! Living the "continuously continuous continuum" of enjoying & glorifying God.